Isobel used her nursing skills when she took an interest in the Downton Cottage Hospital. She found a local farmer, 约翰·德雷克, who was dying of dropsy. She was more familiar with the new technique to cure it and persuaded 克拉克森医生 to try it, saving the man's life. Isobel was later appointed Chairman at the Downton Cottage Hospital, which she co-chaired with 维奥莱特·克劳利. Isobel embodied a different set of values to those of the Crawleys, and because of this was often in conflict with Violet, and 科拉·克劳利. Isobel found fault with the tradition of Violet winning the rose competition of the flower show every year, and she succeeded in persuading Violet of this, which allowed Bill Molesley to win （at least, she motivated the Dowager Countess to lie and publicly state that Bill Molesley had won it）. Isobel persuaded Robert and Cora to turn Downton into a convalescent home for injured soldiers, so as to free up hospital beds at the cottage hospital for critical patients. She took up a position of authority at Downton, as co-person in charge alongside Cora, during the war. She and Cora clashed about the daily running and management of Downton's convalescent home. As a result she left Downton for France to work with the Red Cross. She later returned when she discovered that Matthew was injured in the war, and she has stayed at Downton ever since. Isobel suggested to Violet and Cora that they kept Downton convalescent home open after the war to help the soldiers to rebuild their lives and recover, much to their dismay since both wanted life to return to normal as soon as possible. Violet managed to convince Isobel that refugees left displaced and disadvantaged by the war needed her help more than Downton. Shortly before Matthew and Lavinia's wedding, Lavinia showed mild symptoms of Spanish flu, so because she would be feeling unwell for the next couple of weeks Isobel decided the wedding day would have to be delayed until everyone recovered from Spanish flu. A few hours later, Isobel and Matthew learned that Lavinia's condition had taken a turn for the worse, and sadly Lavinia died of Spanish flu. Isobel attended her funeral. Later on Isobel attended Christmas and New Year celebrations at Downton with her son. Isobel and the Crawley family showed their support for John Bates who was arrested for the murder of his first wife Vera Bates. Alongside the Crawley family and some of the staff, who truly believed that he was not a murderer, she attended John's trial and supported John's second wife Anna Bates, and Downton staff members who were called up to the stand during the trial. She was initially opposed to Matthew's relationship with Mary Crawley, but after the death of his fiancée she helped persuade him to propose to her again, which he did, and Mary happily accepted in January 1920. Isobel was one of the few who felt Sybil should return to Downton with her husband Tom, for Matthew and Mary's wedding, and stood up for their right to do so. Sybil later asked her father if he sent her the money to come to Mary's wedding. Robert said that he suspected that Isobel had done so, and Sybil was determined to ask her, before Violet admitted that she had sent it. When Matthew announced he wanted Tom to be his best man, she happily applauded his decision. Though kind and sympathetic to Tom, she did not disagree with Violet when they insisted he dress the part for the wedding. Isobel's new cause was helping woman reduced by circumstances to prostitution. She found former maid Ethel had turned to prostitution after falling on hard times, and was determined to help her. She supported Ethel through the difficult decision to give up her child to the Bryants. Afterwards, she was kind enough to hire Ethel as her maid despite the disapproval of others, including Mrs. Bird who resigned in protest. Ethel was snubbed in a grocery store, and Isobel said that they should not shop there in the future. Violet Crawley put an ad in the newspaper to find her a new position, in a different place, where she could make a new life. Isobel insisted that it must be Ethel's decision. Isobel was the first person that Matthew told when he learned that he may be heir to Lavinia's father's estate. After Edith was jilted at the altar, Isobel said that the only way to help her was to find something for her to do. Isobel was at the train station to see Matthew off to Scotland to visit Duneagle Castle. She invited both Tom and Dr Clarkson to dinner at her house whilst the rest of the family were away. She praised Tom for his rise, and later attended the Thirsk fair with Dr. Clarkson. She realized that Dr. Clarkson was going to propose to her and she gently let him know that she had no interest in marriage, thus maintaining their friendship. She saw Matthew again at the hospital when baby George was born, and when Matthew arrived he sent her home. It was the last time she ever saw him. Isobel, like her daughter-in-law, is deeply in mourning for Matthew's death. At one point when she, Mary, and Tom talk about their deep loves for their lost spouses, Isobel remarks how lucky they were to have loved them so much. Like Mary, she begins to move on and spends time with her grandson. She says George can call her Grandmama, so Cora can be Granny. Sybbie she decides can call her Aunt Isobel, even if she isn't exactly an aunt, but it is close enough. She quarrels with the Dowager when the latter suspects a gardener Isobel and Dr Clarkson persuaded her to take on of stealing. Isobel goes out of her way to prove his innocence, eventually being proven right. However when Violet falls ill with bronchitis after her son travels to America to see his in-laws, Isobel diligently nurses her, and later they play cards together. She also grows closer to Tom, encouraging him to stay when he considers leaving Downton, and to rekindle his interest in politics. She finds an admirer in Lord Merton, Mary's Godfather. He comes over for tea with Isobel and Violet. At the end he offers to walk Isobel home but while talking about occupations and children, he asks about Matthew （who is obviously dead）. He later sends her flowers, hoping to apologize for his behavior which he felt was rude. He continues to see her by 1923, and when she sees he has arrived at the ball at Grantham House she becomes very nervous, especially when he asks her to dance. Violet notes his interest. Isobel is still being pursued by Lord Merton and Richard Clarkson （the family doctor）. Violet tries to help her, but Isobel does not seem interested. She along with Violet, went to Lord Merton's estate for tea, where he tries to discuss with Isobel the science of quarantine, on which he was reading in a book. Lord Merton later proposes and after considering for a few days, Isobel accepts. However she becomes visibly hurt when both his sons treat her with disrespect and contempt. As she tells Violet before Rose's wedding to Atticus Aldridge, she wonders if it would be right to marry Dickie when she knows perfectly well his sons would hate for them to be happy. Seeing the inevitable failure of the marriage, Isobel refuses Merton to which Violet remarked about how delighted Dr.Clarkson will be. Isobel heavily disagrees with Violet over what should be done with the hospital, as she believes the Crawleys should relinquish control and look forward to the joys of new equipment, whereas Violet thinks the hospital should be left to the family. Isobel allies with Dickie and Cora and they also pursuade Dr Clarkson to change his opinion in their favour. When the hospital is taken into the new control, Violet is immediately removed from her position as chairman, with Cora appointed as the new. Isobel remains the almoner and happily supports the change. Later, Amelia Grey begins to persuade Isobel to marry Lord Merton, which would allow Amelia to control the household while Isobel should become his nurse. Isobel pays a visit to Amelia at Cavenham Park, leading to Isobel informing Amelia that before she awake Dickie's dreams she needs Larry to show his approval of the marriage himself and not only through Amelia. When Violet heads off to France, she asks Isobel to deliver a letter to Robert which tells him of Violet's plans. They all later head downstairs to the servants' hall to find a present left for him: a dog whom he names Tiaa. Whilst on a visit to the cemetery, Isobel finds Mary at Matthew's grave. She assumes that Mary wants to marry again, at which point she is delighted and congratulates her, and is later invited to the wedding. Toward the end of 1925 Dickie develops anemia which is believed to be fatal by his Harley Street doctor. He breaks the news to Isobel when she visits him, worried because she haven't heard from him since he got back from London. Devastated, Isobel goes to Violet who kindly comforts her and helps her realize that she actually loves him. Isobel decides to support Dickie as his friend during his last days. But when she tries to visit him, Amelia Gray denies her access to the house. Isobel, upset, angry and sad goes back to Violet. Violet suspects that Dickie is held isolated at Cavenham Park by Larry and Amelia because they don't want any claims on the estate before he is gone. Violet, stating that "if reason fails, try force!" then pushes her way into the house with Isobel by her side. Dickie, hearing Violet's voice, escapes Larry's vigilance and slips downstairs, very upset at the fact Isobel has not visited. Violet, however, reveals that she did try to but was denied access. When Amelia and Larry try to keep Dickie under lock and key, Isobel at last picks the fight for him and suggests he have his valet pack his things so he can leave and live with her at Crawley House and also declares she will marry him "as soon as it can be arranged" . Dickie is overjoyed by this and happily agrees. They marry and after a while Dickie is feeling better and secretly asks Dr Clarkson to run new tests because he doesn't want Isobel to get her hopes up. Isobel, though, discovers him at the hospital and finds out. They both attend the wedding of Edith to Marquess Bertie Pelham of Hexham and just before the wedding ceremony Dr Clarkson tells them that, according to the new tests, the anemia is re-diagnosed as non-fatal iron deficiency anemia. Isobel and Dickie are both able to quietly rejoice in this good news. Isobel is a strong-willed individual with a set of values that often clash with the aristocratic views of the other Crawleys, causing tension at times. She is not afraid to speak her own mind, and sticks to her principles no matter what. Isobel believes that the world needs to adapt and change with the times. She takes up causes to help the disadvantaged and strives to make the world a better place. Isobel has a strong "need to be needed" and states herself that she cannot work in a place where her assistance is not required, causing her to chase work in the places that need assistance most crucially. Isobel is a "hands-on" person, good at completing tasks and getting things done, with advanced medical training which comes in handy on several occasions. Isobel is a strong and helpful person. She deeply loves and cares for her only son Matthew and is devastated by his death. Isobel has a close relationship with her son and lived with him through to his adulthood, both in their house in Manchester, and in Crawley House. She encourages him to move on from Lavinia's death and later to mend his relationship with Mary. Isobel helps Dr Clarkson at Downton Cottage Hospital, eventually becoming Chairman there with Violet. During the First World War she helps run the convalescent home at Downton Abbey, working closely with Dr Clarkson there. They develop a close friendship over time, with Dr Clarkson becoming interested in a romantic relationship with Isobel. Isobel realises this before he says anything and finds a way to let him down gently before he proposes, and so maintains their friendship. Isobel has a rather formal and unremarkable relationship with her daughter-in-law. Like Mary, she has difficulty moving on from Matthew's death, and is pained to see a resemblance to her son in George. Eventually she begins to move on, and at first is dismayed to see Mary being pursued by other men, but in the end wishes for her daughter-in-law to be happy and does not speak against it. Once Sybil married Tom, Isobel was one of the first to insist that they come back for Mary's wedding. She admitted she knew little of him when he was the chauffeur apart from good morning and good night, but she professed her liking for a man of strong beliefs. When Tom did come back, she encouraged him to remain himself and stand up for what he believed in. After Matthew's death, Tom helps Isobel through her grief and becomes like a second son to her. Isobel inquired after him and his considerations to leave Downton, and they later danced together during Robert's birthday celebration. Isobel tries to rekindle Tom's interest in politics, encouraging him to consider running for the local council and to attend a political rally where John Ward would speak. She later defends him and his beliefs against schoolteacher Sarah Bunting. In 1924, when Isobel is insulted by Larry Grey it is Tom who immediatly jumps to her defense and throws Larry Grey out of the house. In 1925, when Dickie is found to have fatal anemia, Isobel finally realizes that she is deeply in love with him. Although being thwarted by Larry and his new wife Amelia, she decides to marry him so they can spend the time he's got left together. After a few months Dickie is feeling better and asks Dr Clarkson to run some new tests. Just before Lady Edith's wedding at December 31, Dr Clarkson tells Dickie and Isobel that the anemia is rediagnosed to non-pernicious. "I like a man of strong beliefs." - to Violet and Cora about Tom Branson. "Have you changed your pills?" - to Violet over Lady Edith's interest in becoming a journalist. "Mr Branson is a keen political thinker. He proves this by not being afraid to question his own beliefs." - to Sarah Bunting in defense of Tom Branson. "I find it hard to see Mary come alive again"- about Mary mourning for Matthew. "I thought the hospital a great credit to your father's memory, but I am afraid the good doctor and I did not see eye to eye." - to the family after first working in the hospital. "What shall we call each other?" - to Violet Crawley when she first arrived at Downton. 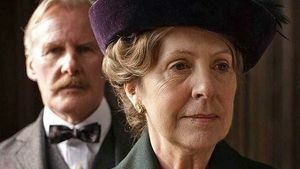 In "The Chronicles of Downton Abbey: A New Era" by Jessica Fellowes and Matthew Sturgis, Julian Fellowes relates that the character of Isobel is based on a psychology professor who was the wife of his godfather. After Matthew's sudden death, Isobel from then on was in the same situation as Mrs Bryant; having lost her only child and son, but only has a grandson left.